Thinking of furnishing your home? Then it’s time to ask yourselves that inevitable question: whether you want to go for solid wood furniture or composite furniture? In the unending rivalry between these two genres, solid wood furniture always wins the battle. Not only does it offer utmost durability, solid wood also always delivers on the aesthetic front. Who could appreciate that short-lived veneer coffee table when they see the amazing traditional media console that makes up the face of your living room? And nothing can ever compare to an intricately carved solid wood bed headboard when you’re trying to make a statement in your interior design. So you might be thinking what constitutes as hardwood furniture, right? Let’s take a look so you can get some insight. So what’s the first thing that comes to mind when you think of ‘solid wood furniture?’ We bet your initial thoughts are that of vintage, kitschy pieces that most people find only in garage sales these days. While somewhat true, solid wood furniture is much more than that. While its aesthetic is mostly organic, you can definitely find stylish, contemporary pieces in the market as well. Let’s take a look at all the facts that you need to know about it! Solid wood furniture basically entails that all exposed and covered parts of a piece are made of authentic natural wood – no particle boards, plywood and wood fibers even in the joints. Both hardwood and softwood can be used in the designing of such furniture. You might be wondering what’s the difference between hard and soft wood, right? Well, hardwood basically comes from the trunks of deciduous trees like oak and beech, while softwood comes from gymnosperm trees like conifers. The contrast in timber hardness is what differentiates the both. It would be an interesting point to note that solid wood is harder and denser than engineered wood, which helps it retain its authentic visual and functional integrity for a long time. 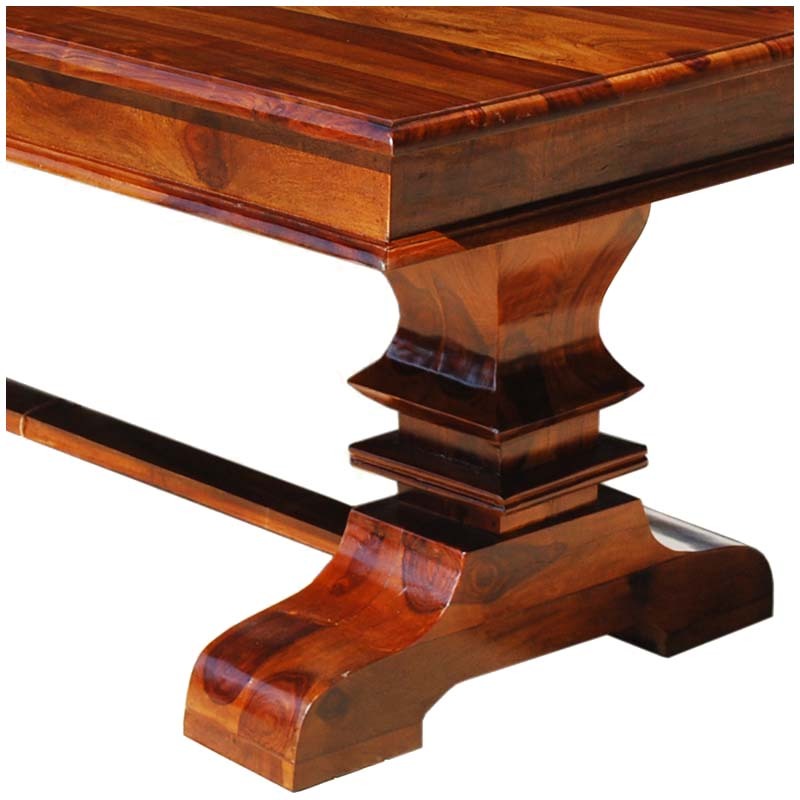 The wood grain details really stand out in the sharply carved legs of the Tiraspol Solid Wood Pedestal Table. 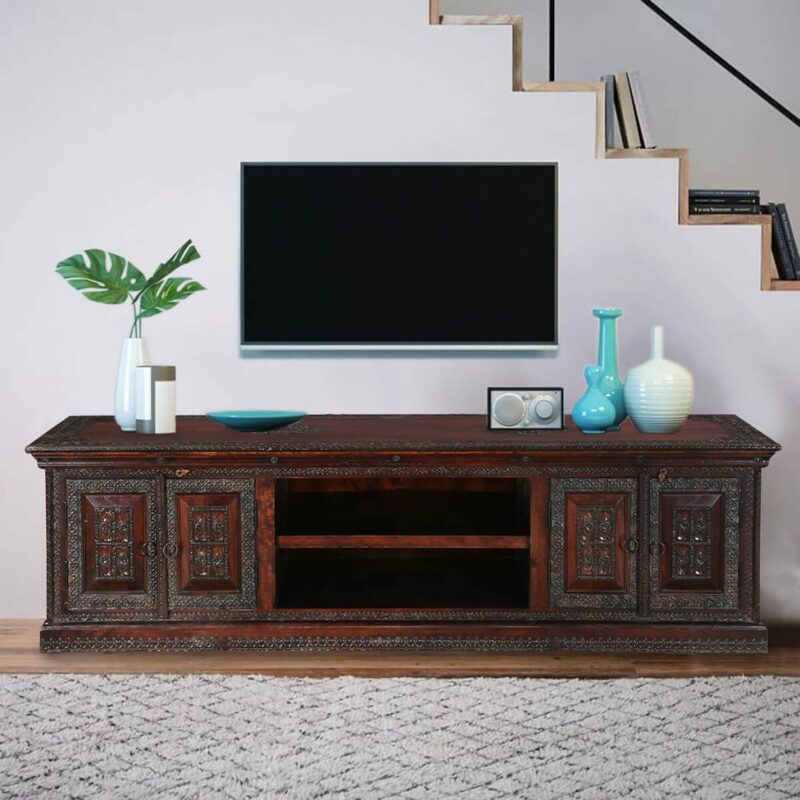 I love the intricate detailing and the rich, warm colors on this exquisite Mango Wood 71” Media Console. You might be thinking if your investment might be worth it or not, so it’s important to note that solid wood furniture features a consistent appearance and boasts an unfettered elegance that can only be inspired by nature itself. It is also strong and durable. One of the reasons you do find those vintage, kitschy pieces at garage sales these is that solid wood furniture can last for a 100 years (or more) if it is properly cared for & maintained. It retains its original aesthetics for a long time, and even acquires a beautiful patina with age. You may be making a bigger and more expensive investment, but it’s going to be worth it in the long run. 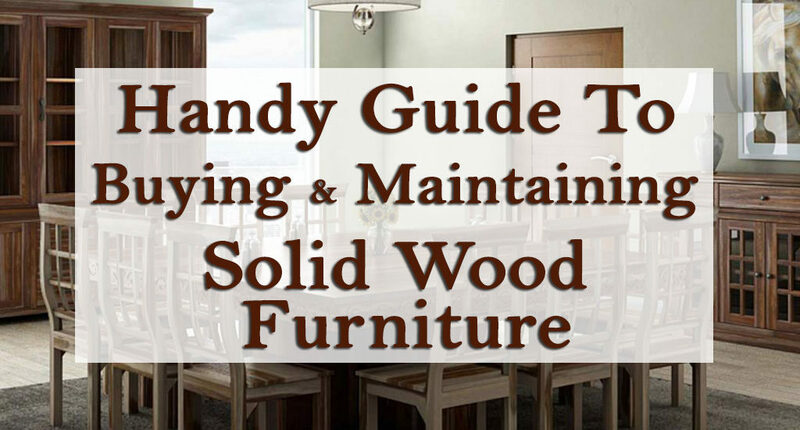 Before we go any further, you might want to understand what exactly is it that you’re buying – every solid wood piece is categorized into a typology of furniture, which is what you, as the buyer need to keep an eye out for! If you want to buy a solid wood piece with history and a lot of distinct character, then this would be the category for you. Reclaimed wood comes from a number of places – mostly used items like old boats along with decking from barns and factories. The disrepair of its previous function means it can be sustainably molded into some of the best and most unique solid wood furniture pieces you’ll see. It usually features a rustic, individualistic look that often comes with a mismatched grain. It’s absolutely unique and eco-friendly. 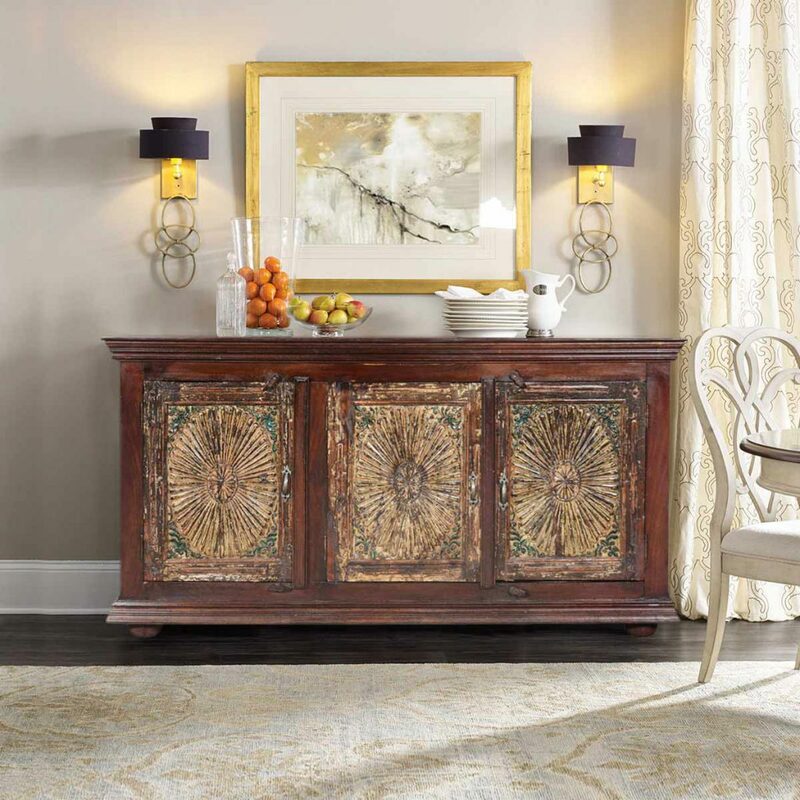 The Antique Sunburst Mango & Reclaimed Wood Sideboard Buffet Cabinet combines elegance with rustic charm, so it can suit many different decor styles. They say that nature is the best designer, and that is definitely true when it comes to live edge solid wood. This category of solid wood furniture should be your go-to when you’re looking to emulate a bit of nature in your home. It’s curated from natural wooden slabs that are air-dried, de-moisturized and put into a kiln dry. Any kind of hardwood or softwood species can be used to make live edge tables. You can definitely expect to make a statement with it. 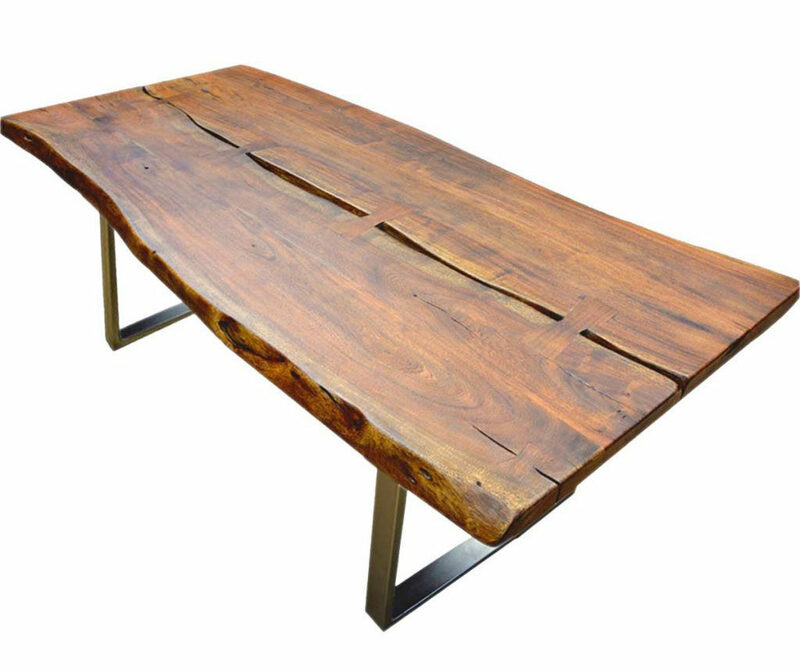 Live edge tables such as the Live Edge Acacia Wood & Iron Dining Table pictured above stay true to the pure, natural state of wood. Small imperfections, knots, splits, and cracks are left in place, lending an organic nature to each unique, one of a kind table. Looking for completely new solid wood furnishings that have been sustainably sourced? Then you should definitely look at new wood! This kind of wood – be it hard or soft – is the one that is being used for the first time to construct something. New wood furniture is classy, refined and offers a beautiful aesthetic. 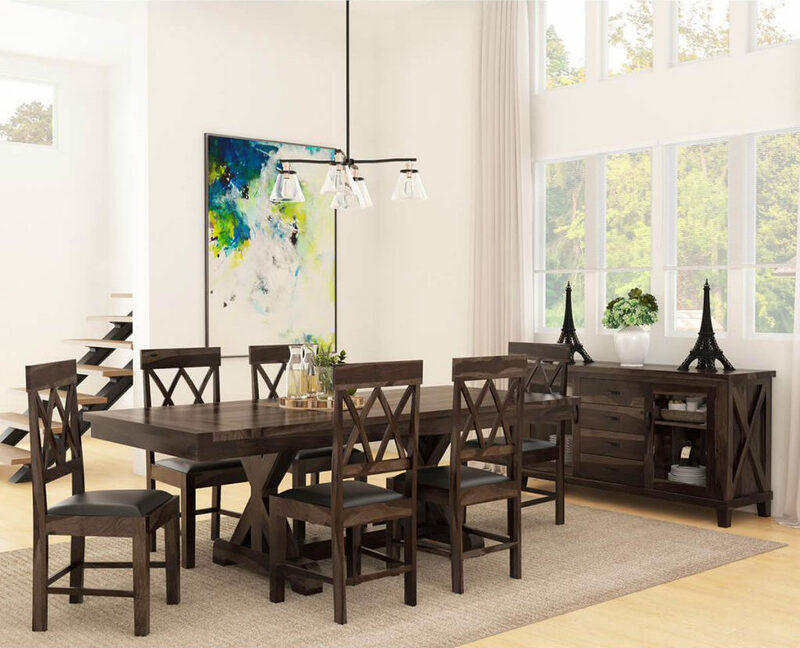 The combination of the cross pattern and the dual-tone wood makes the Antwerp Farmhouse Solid Wood 8 Piece Dining Collection the perfect addition to any house that is trying to achieve that warm, homey feel. What makes Solid Wood better than its cheaper counterparts? Now you might be wondering why you should choose the more expensive solid wood furniture over the cheaper composites? Here’s why… solid wood furniture is always a better substitute for plastics, veneers, MDF and other composites not because of its many characteristics. Let’s take a look at what makes this kind of furniture better than cheap substitutes. Genuine wooden grain: The beauty of the authentic wooden grain is truly unparalleled. No matter how you mix and match various composites, nothing can substitute for nature’s originality. 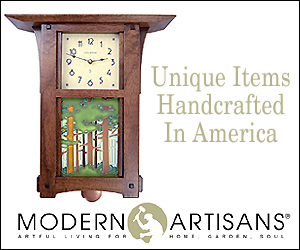 Just imagine the class and elegance it can imbue in your home! Zero harmful chemicals: As a homeowner, you’d want your furniture to be as healthy, hygienic and eco-friendly as possible, right? Well, synthesized furnishings are always heavily processed, which means that they’re mostly composed of chemicals as opposed to solid wood, which comes from natural sources, and is handcrafted. Dignified aging: Nobody wants to feature cracked, peeling furniture in their homes, which is why it’s important to note that composite furniture never ages gracefully. However, solid wood can easily be refinished when it starts to show its age. Eco-friendly: As for sustainability, solid wood comes from trees, which is a renewable source. Ethical sourcing can ensure that the trees being used are being carefully replenished and replanted. 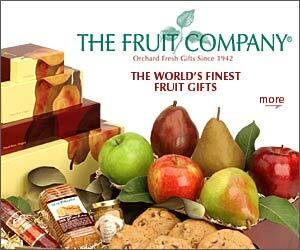 It also uses relatively little energy during its production process, especially if it is handcrafted. 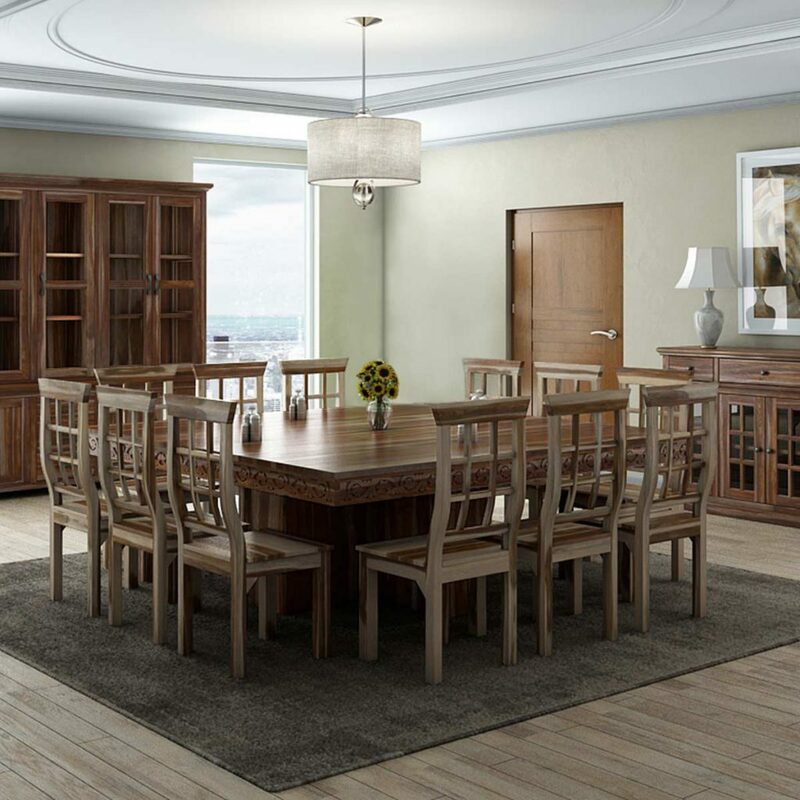 Dine in exquisite style with the over-sized Dallas Ranch 15 Piece Square Pedestal Solid Wood Dining Room Collection. The combination of colors, intricate woodwork, and solid wood construction make this an absolutely breathtaking set. Long-lasting: With solid wood, you can be assured that you’re making an investment of a lifetime. While veneers and composites can be a feasible short-term solution, if you’re looking for a blend of style, aesthetics and durability, nothing can beat solid wood furniture in that department. 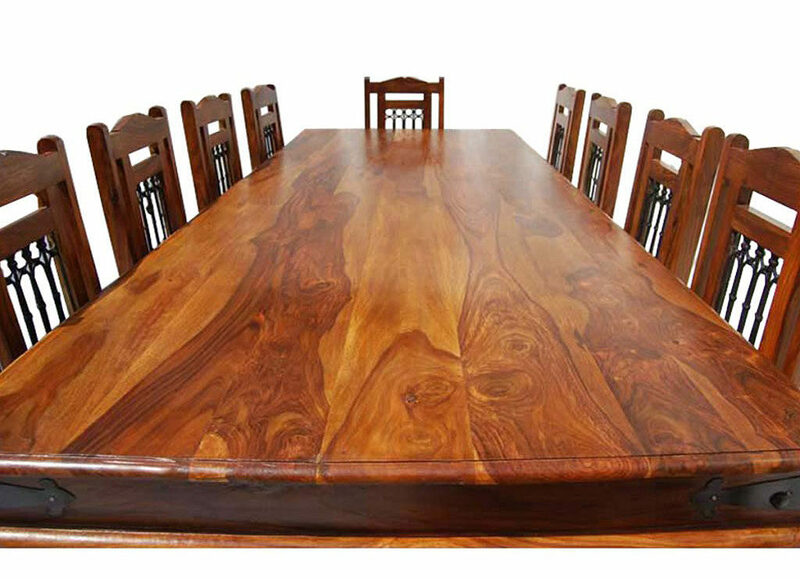 Heirloom Quality: Lastly, strength, sturdiness and longevity are some of the key qualities of solid wood furniture. It’s a practical choice, because no matter the damage, it can be easily repaired. Whether it is a scratch or a stain or even a watermark, you can easily have all of it rebuffed and refinished. Even the stains can be leached out with proper techniques. The dining tables, accent chairs, coffee tables, flower stands, bedroom collections and more you choose today, can all become a family heirloom someday. 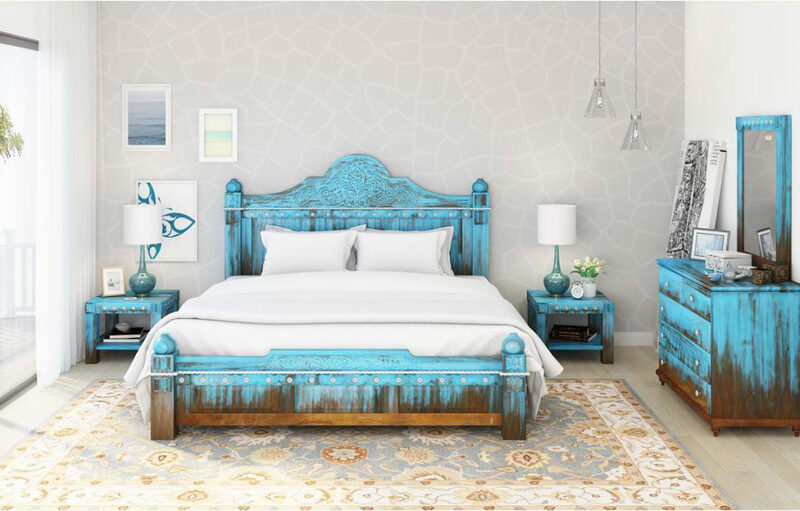 How can you NOT love the coloration on this rustic and stunning Empire Blue Dawn 5 Piece Bedroom Collection. This is the kind of look you can only get with true, solid wood furniture. Regular cleaning: For daily cleaning, you can simply use a feather duster to clear away the dust. But if you ever want to go the extra mile, you can simply clean your solid wood piece by sponging it off with a mixture of warm water and mild dish soap. Just be sure not to soak the surface, and use a toothbrush to get to small nooks and crannies. Placement matters: If you’re thinking of putting your piece near a heat vent, then think again. It’s best if you don’t place solid wood furniture near heating vents, as it can cause inadvertent contraction and expansion, which can make the wood crack. Quick touch-ups: Terrified that your child has inadvertently scratched the surface of your precious investment? We’ve got you covered. If you want to hide a stain or a scratch, esp the feet of the furniture, you can simply use an appropriately colored shoe polish to hide the marks. Taking care of dryness: Annoyed at those pesky dry spots that keep ruining the beautiful patine? You can use lemon oil to preserved that particular area! So as you can see, solid wood furniture offers so many amazing qualities! It’s strong, durable, easy to maintain, eco-friendly and comes in so many beautiful varieties! Your home would definitely be worth more in quality and visuals if you choose to go for such furnishings!